The use of war weapons and tactics in local police departments fuels the widespread mentality that police in black and brown communities are at war against the people they are meant to serve. The reactions of law enforcement officers to the Black Lives Matter protests have proven that local police departments are both irresponsible and discriminatory when utilizing military weapons. 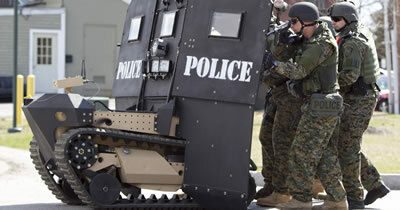 I sign this petition urging that Defense Secretary Ashton Carter suspend the 1033 Weapons Transfer Program that authorizes the transfer of military equipment to local U.S. police departments. 12812 1 year ago Chad Michaud Oakland, CA Stop arming the police state. These are killing tools that will be used to wage an unjust war on drugs against Americans. 12807 1 year ago Leighton Bradford Southaven, MS Police do not need this equipment!